In August of 2007, in response to numerous requests, we formed Clearly Visible Presentations, LLC. Our mission is to teach the science and technology of optics, lighting, visibility and digital photography to the forensic investigation community. We do not provide direct consultation on forensic cases. But, our staff has over 40 years experience in the courtroom environment. We understand the tasks assigned to forensic investigators and provide training to ensure that evidence is collected and analyzed using scientifically valid techniques. What's your reason for not using high beams? You are in your 2009 Chevrolet Malibu in a forested area just outside Seattle, Washington. It is nearly midnight on May 7. There is a full moon overhead. You are operating on low beam. Suddenly, you notice something is not right up ahead. 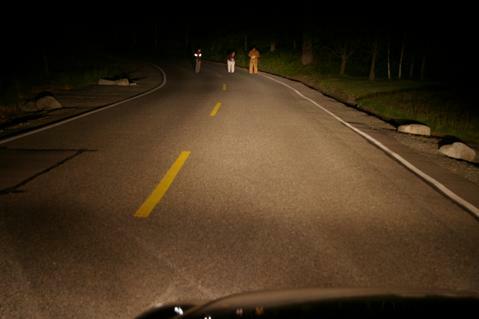 You switch to high beam and find three people standing in the road taking light measurements. Luckily, even though the speed limit is 55 mph, you were stopped because you were participating in the test. Would you have been able to stop if you had been traveling on low beam at 55 mph? Until recently, I believed that the great majority of the United States motor vehicle statutes only addressed when drivers should not use high beams and rarely encouraged their use. It seemed to me that using high beams was considered a sin worth of severe castigation and enmity. But, to be sure, I conducted an investigation into the statutes for each state and the District of Columbia to learn what their position was. I learned that, in fact, I was wrong. 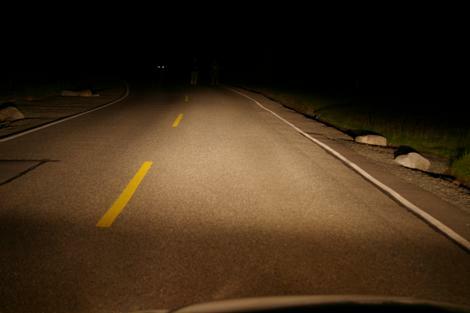 The primary finding in my research is that 40 of the states, at least, encourage or, in my opinion, require the use of high beams when driving at night in darkness conditions when there is no leading or opposing traffic. The relevant statutes of each of those states are modeled on §12-223 of the NCUTLO Uniform Vehicle Code and Model Ordinance 41 CFR 50-204.75. That section states "Whenever a motor vehicle is being operated on a roadway or shoulder adjacent thereto during the times specified in §12-201, the driver shall use a distribution of light, or composite beam, directed high enough and of sufficient intensity to reveal persons and vehicles at a safe distance in advance of the vehicle..." Some states slightly change that phrasing but maintain the same requirement. I have prepared a document that summarizes the statutes in each state which relate to the use of high beam and low beam. You may download that document by clicking on the below icon. Be aware that my research was done in May/June of 2016 and accessed each state's web site to find their statute(s). There always remains the possibility that the referenced sites were incorrect or that the statutes have changed. Do your own research for the state(s) in which your cases are venued. DRIVE ON HIGH BEAM UNTIL YOU CAN'T!